Congratulations to our Director, Ashley Armijo, as she recently won the United States Evening Association (USEA) 2018 Area X Adult Rider High-Point of the Year Award. Area X is in the southwest region of the States including: Arizona, New Mexico, and Nevada. Three day eventing is an equestrian competition where a single horse and rider combination compete against other combinations across the three disciplines of dressage, cross-country, and show jumping. Ashley is a born and raised New Mexico local that has been riding horses since she was 6 years old. She has been competing in three day eventing for over 20 years. She worked very hard to be on the USEA Area X Young Rider team in high school however her horse became ill and she decided to take a break from riding in college. In 2012, a good friend of hers offered her a horse to ride and so the three day eventing began again. Ashley currently has two New Mexico local homebred Holsteiner horses from Rancho Corazon that she owns and competes. Cimbria RC is an 8-year-old gelding that had a fabulous 2018 year winning two competitions, placing in the top five in four other competitions, and competing in the American Eventing Championships. Ashley recently purchased Cimbria RC’s full sibling Encore RC. Encore RC is a 7-year-old mare that just started a career in three day eventing. Encore RC finished 3rd in her very first event in 2018 and has a promising future. Therapeutic riding and NMCTR has always been a passion of Ashley’s but it is very apparent her personal riding and competing is where Ashley’s heart is. We are so proud of you Ashley and hope you continue to accomplish your goals and follow your dreams! Thank you to all the sponsors and donors that contributed to USEA Area X Adult Rider High-Point of the Year Award. 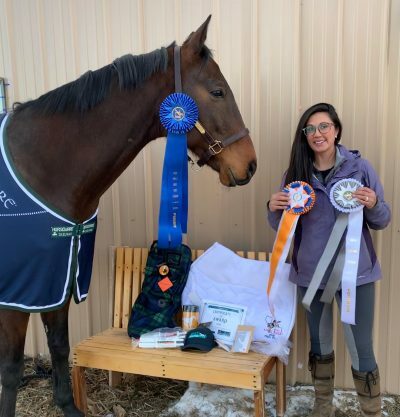 We know Ashley will enjoy all her prizes from: GGT-Footing, HorseTech, Inc., Greenway Saddlery, Riding Warehouse, Equine Matrix, Oralx Corp, and GumBits.